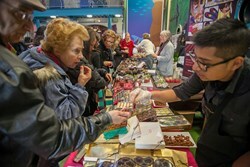 About 35 chocolatiers and specialty-food merchants will offer samples and sales of their treats, while celebrity chefs give cooking demonstrations and mentalist Marc Salem astounds audiences, in this fun extended day at the Aquarium. And it's all for a ticket price that's less than the regular Aquarium admission. Sample and buy fine chocolates and other specialty treats from more than 30 vendors attending Chocolate World Expo on Jan. 26 at The Maritime Aquarium at Norwalk. Less than three weeks before Valentine’s Day, thousands of Connecticut’s chocolate lovers will be able to shop for gourmet sweets and unique treats on Sun., Jan. 26 when Chocolate World Expo once again takes over The Maritime Aquarium at Norwalk. About 35 local and regional vendors will offer samples and sales of their delicious and decadent chocolates, baked goods, gelato and specialty foods. Vendors will be set up throughout the Aquarium’s galleries, which will be fully open that day – at a lower cost than normal – making the event an outstanding family value. Expo/Aquarium visitors will find not only traditional and gourmet chocolates, but also unique offerings like chocolate tarts, chocolate-covered pretzels, chocolate balsamic dressing, chocolate-covered bacon and even chocolate-scented bath soaps. Expo producer Marvin Baum said Chocolate World Expo is for people who are serious about chocolate and who love unique specialty foods. For ready-to-eat treats, Aurora Gourmet will have their chocolate fountains flowing, while Bonjour Creperie will be making chocolate crepes and Pika’s Farm Table will serve authentic Belgian-style waffles dipped in a choice of white, dark or milk chocolate. But Chocolate World Expo isn’t entirely about chocolate. Vendors also will present baked goods, specialty foods, cheeses, gelato and even fine soaps and bath products. Cooking demonstrations using chocolate will be led by celebrity chef Barret Beyer (Fox TV’s “Hell’s Kitchen”) at noon, 2, 4 & 6 p.m.; and by executive chef Lawrence Rosenberg, recipe-book author and owner of Bacon Bites, at 1, 3 & 5 p.m.
Plus, in place of the Aquarium’s regular daily IMAX® movies, Chocolate World Expo instead will present five free 40-minute shows by “mentalist” Marc Salem in the IMAX Theater. An expert on non-verbal communication, Salem has been astounding audiences for decades – and also Mike Wallace in a “60 Minutes” segment – with his seeming ability to read minds and perform mental magic. Salem’s shows will be at 10:30 a.m., noon and 1:30, 3 & 4:30 p.m. Seating is strictly limited to 300 seats per show. Audiences will be seated on a first-come, first-served basis. All of The Maritime Aquarium exhibits will be open during the Expo – and will stay open two hours longer than normal: from 10 a.m. to 7 p.m.
Special ticket prices on Jan. 26 are just $15 for adults and $10 for kids 3-12. These prices include Chocolate World Expo admission, all Maritime Aquarium exhibits, the cooking demonstrations and Marc Salem mentalist shows. Aquarium members save $2 per ticket. For more information about Chocolate World Expo and to purchase tickets, go to http://www.chocolateworldexpo.com or http://www.maritimeaquarium.org.